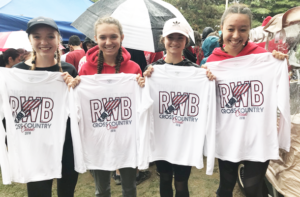 Not rain, or mud, or the sudden blast of chilly weather could stop senior all-state runner Sarena Seeger from getting a second-place finish and a personal best time on September 8 at the annual Red, White, & Blue Classic. She ran the 3.1-mile course, along with 230 other WPIAL Class AAA girls, in 18:59.28 seconds. Her time, and those of juniors Grace Sisson – who placed 5th and also set a personal record at 19:20.21 – and Brooke Krally (12th, 19:51.15), and senior Annika Urban (16th, 20:04.28), contributed to the reigning state champions’ second-place team finish. Junior Christian Fitch, one of the most promising runners in the WPIAL since he was a freshman, finished at the top end of boys’ group in third place with a time of 15.47. Grace says she finished pretty much where she figured she would and attributes her improvement to doing small adjustments that are within her control. Grace’s personal goal is stay with the lead pack, finish in the top-five during the season, and then the top-10 at WPIALs and the state meet. Some newcomers also had notable performances and give reason for optimism in the coming years. Freshman Ethan Napolitan placed 10th among all freshman boys, while fellow freshmen Riley McIntyre was 7th and Gabrielle Kline was 12th among all girls in their age group. The Red, White, & Blue Classic always draws some of the region’s top runners. 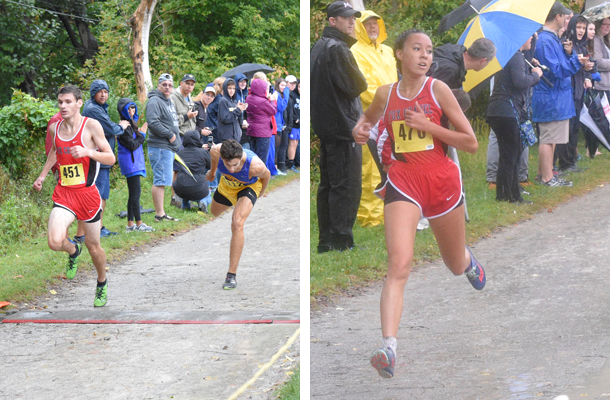 Sarena, Christian, and Grace were designated as elite performers prior to the event. This year there were more than 500 runners competing in just the WPIAL Class AAA division, including 28 girls’ teams and 32 boys’ squads. But on September 22, the runners will face even tougher competition when they travel to Hershey for the annual PIAA Foundation Cross Country Invitational, the largest cross country event in the state. The course is the same one that’s used for the PIAA championships. Last year, Christian ran the course at the Foundation invitational in 16.45 seconds, but is shooting for the low teens, or even the 16-minute mark. He says he’s already 20-to-30 seconds quicker than he was in the 2007 cross country season.